"An easy to use, fast and simple remote access viewer." RealVNC is a remote access viewer you can use to access another PC directly from your desktop. It's a very useful thing to have, my mom often doesn't understand many things on her computer such as how to open Skype and then make a video call and I have spent a long time coaching her and it has been very difficult as we live in different countries, but with a program like this I could have literally shown her from my PC , how cool is that to be able to remote connect to any PC around the world. 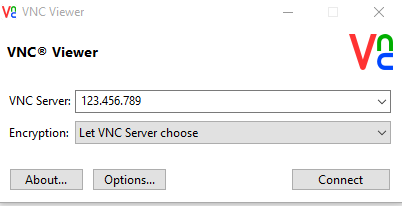 RealVNC free download is also surely a great tool for owners of internet cafes and businesses that have more computers than staff, you can remotely access all of them without leaving your seat! I briefly connected to my workmates computer, it connected very fast with no problems and I was able to see and control everything he had on his screen again without leaving my chair. There are many different reasons why you may need to remotely access someone else's computer and RealVNC is perfect for this it's free, it's user friendly and fast and it takes only a few seconds to download.